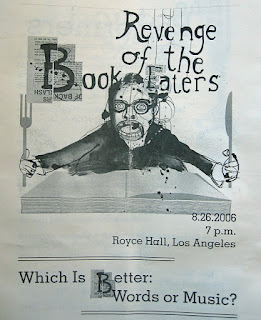 Saturday night was the Revenge of the Book-Eaters and the wife and I had a fun time. 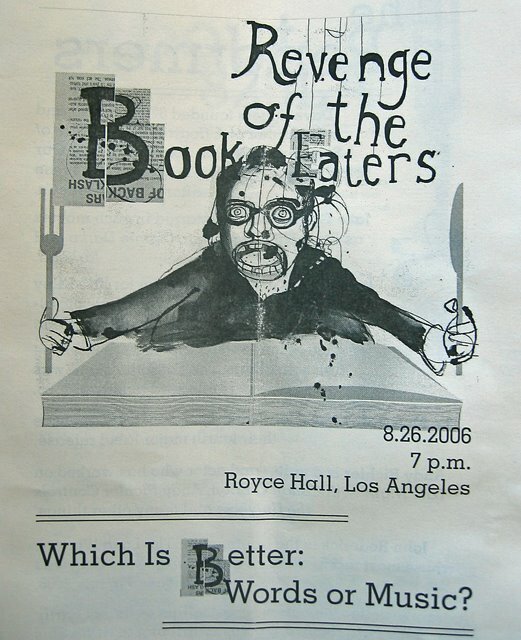 We arrived at Royce Hall (UCLA) at 7:00 pm, an hour before the shindig was supposed to start. We were told that the doors to the hall wouldn't open until 7:30 so we waited in the lobby munching on tasteless chocolate chip cookies and looking over the overpriced 826LA merchandise. I suppose the merchandise should have been overpriced since this was a charity event and they were trying to make money. $7.00 for a tiny poster still seemed a little steep. While we were waiting for the doors to open, the wife whispers in my ear - Look! That's Fiona Apple. And sure enough, there she was, standing in the middle of the auditorium lobby waiting for the doors to open. The wife doesn't have a very high opinion of "the one-hit-wonder" Fiona Apple. Yeah, She shot her career in the foot with some of the things she's said but I don't think that makes her a bad person. The doors opened at 7:30 and the show started a little over a half an hour later. Andy Richter was the host for the evening and he was funny and entertaining. He started off with a Jim Morrison skit that made people laugh and cringe. He then introduced the first act. The first act was a two man group called The Mountain Goats. They are an indie rock band with a rambling story telling kind of rock-folk sound. I wasn't very impressed. I was surprised about the last song of their set which, unfortunately I do not know the title of, was weird and funny in the way the wife and I like. The song was interesting but It isn't enough for me to want more. The next act was Jenny Lewis, frontwoman for Rilo Kiley. She came across very country-blues with a very intriguing voice. Her last song, Rabbit Fur Coat, was down-right bizarre which, of course, made it the best song of her set. I think I will have to do some further investigation into Jenny Lewis and Rilo Kiley. Jenny Lewis was followed by a plea for money by Dave Eggers, founder of 826Valencia. Dave read some of the stuff written by some of the kids at the 826 organization. The readings were hilarious. One went something like this - Picture a collage of a Gingerbread man and a Peanut - The caption reads (I paraphrase due to my bad memory): A ginger man married a peanut - I wonder what their children will look like? This and other readings had the audience roaring. After a brief intermission, Sarah Vowel, a writer and regular contributor to This American Life, read one of her stories. This one concerned a German cartographer's journals. This cartographer accompanied an explorer (John C. Fremont) in the 1840s. Andy Richter read for the German cartographer's part using a terrible German accent that seemed strangely appropriate for the humor of the story. The last act of the night was Aimee Mann. She and her band did six tracks. She was, as expected, awesome. Left me wanting for more. I knew two of the six songs - I will have to explore more of her older stuff. The night ended with the Mountain Goats and Jenny Lewis doing an unrehearsed rendition of Hank Williams' "I'm So Lonely I could Cry." It sounded unrehearsed and kind of ended the night with an unsatisfying whimper. Warts and all, we had a fun time, experienced some new music, and left with a smile - A good night out. Last Sunday, the wife and I went to the movies and saw "Little Miss Sunshine" (IMDB.com). I have to say that I haven't laughed so hard for a long time. The horn scene was just hilarious. It was a great movie. Highly Recommended. We saw the movie at the Century Downtown Theater which is in downtown Ventura, CA. The finale of the movies is supposed to be in Redondo Beach. Turns out, as the film family approaches Redondo Beach, scenes on the screen became more and more familiar. The Finale was filmed just four-five blocks from the movie theater! That was so weird! We even drove by the hotel in the movie on the way home. We can't wait! We have been waiting for Aimee Mann to come to our area for awhile now and the whole event sounds fun. My wife and I went on a great vacation this summer. The planning started over a year ago when I was looking into going to the Galapagos and Easter Islands. After looking at all the literature, we decided it was too expensive and would take too long. We know our limit on the road is around 10-14 days. Looking into alternatives, I suggested Peru. Why Peru? Well, when I was a kid, I was interested in UFOs, Ancient Astronauts, and all the other bogus stuff that kids can sometimes be interested in. Peru is full of that stuff - the Nazca Lines and Machu Picchu are the major ones. I went to AAA and asked about Peru tours since planning this trip alone seemed a little overwhelming. One of the suggested tours caught my eye - General Tours' Grandeur of Peru. The tour was 12 days (2 travel days and 10 days in Peru) and covered Lima, the Nazca Lines, Cuzco, Machu Picchu, Puno, The floating Islands of the Uros, and Lake Titicaca. The only thing it really didn't cover was the Amazon portion of Peru which suited us fine since neither of us were interested in the jungle. We booked the trip in December 2005 with a departure date of 16 July 2006. All I can say about the trip is that it was awesome. It beat all expectations and the funny thing is, it was the small things that made it wonderful. My jaw dropped when I saw the waves and waves of birds flying near Ballestas Island (near Paracas). 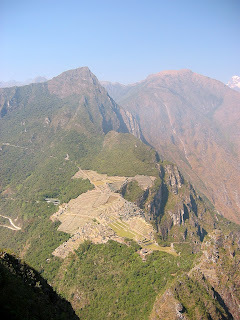 The incredible view of Machu Picchu from the peak of Wayna Picchu - Wow. The fun game of dress-up on the floating Islands of the Uros (I wasn't sure about this but it turned out to be fun). This was my first experience on a multi-day guided tour and I wasn't sure what to expect. I was afraid that I wouldn't see all that I wanted to see. I thought the tour would be slowed down by slow tour members and that there would be a lot of whining from malcontents. I was totally surprised. Our tour consisted of 20 people - 20 people who were never late, never complained, and got along remarkably. I know we were lucky. Talking with more experienced tour members indicated that this group was better then normal. The tour guides said that we were one of the easiest groups they had ever had. This made for a more enjoyable experience for everyone. I took over 550 pictures. Only a few captured the awe and majesty that I saw. This trip really touched me deep down. The Travel bug has bitten me hard and I can't wait to plan our next vacation. I only hope it will live up to Peru. The first post of my second Blog. I haven't been very successful at keeping a journal or maintaining a Blog. I did have a dead-tree journal after I left College but it didn't last very long. It did last longer then my first Blog attempt last year which lasted a couple of weeks. I think I set my goals to high. You don't have to update every day. Once a week is fine. So once again I am going to start a Journal and see if it lasts. I am also considering making it public but I haven't decided yet. Of course, if you are reading this then I guess I decided to make it public ... Whatever.